Betsy DeVos is stunningly unqualified to be our next Secretary of Education. She has neither the educational background nor the administrative experience to run the Department of Education (ED). Certainly there are other issues of concern but we don't even get to those when someone cannot do the job in the first place. ED has 4,400 employees and a budget of $77.4 billion. Two thirds of the countries on the planet do not have a GDP of $77.4 billion (it would be 66th of 190). It is an enormous undertaking. DeVos has some business experience, which is probably overstated, as the Chairman of the company that she and her husband own but nothing that would prepare her to run ED. ED is responsible for all federal assistance to education and national policy. I suspect that, like many Christian conservatives, DeVos would like to eliminate the department that Trump has tapped her to head. Furthermore, conservative Christians are typically advocates of the dissolution of public education in favor of Christian-run schools. And that is DeVos' only tie-in to education. As a Republican operative (she was chair of the Michigan Republican Party), DeVos' mission in life has been “school choice.” What school choice really means is the government paying for kids to attend religious schools; something that has the potential to ruin public education (and perhaps that's the point). School choice also means for-profit charter schools that the government pays for — again diverting resources from public education. DeVos takes credit for, and points to, the charter school program in Florida which has been plagued by scandal after scandal. Taxpayer funds have disappeared at a remarkable rate. Not only does local government pay the tuition, it provides the start-up capital. Many schools have closed with less than a year of operation in part because ownership is not invested. In spite of consuming taxpayer funds these schools are not accountable to taxpayers. Many of Florida's Christian schools magically became charter schools. Why not? One reason is that the government is now subsidizing Christian schools which is unconstitutional. Once you get past Free Exercise of Religion and the Right to Bear Arms these people don't seem to care very much about constitutional rights, prohibitions and responsibilities. Also, the Establishment Clause doesn't say precisely what it says. But getting back to Betsy DeVos she doesn't seem to know anything about education. Moreover, as a conservative Christian we are obligated to question her understanding of science. Does she even believe in evolution? Does she realize that, for an educator, that climate change is no longer a political issue but one that has been settled by the overwhelming consensus of climatologists? In fact, DeVos has no secular education experience. She went from Holland Christian High to Calvin College. Another issue is the highly politicized Common Core. Common core is nothing but a set of K-12 standards agreed upon by the education commissioners of 48 states plus the District of Columbia on a clearly bipartisan basis. There was no agenda other than the best interests of children and the desire to make them competitive in the world economy. Eventually, Oklahoma, Texas, Virginia, Alaska, Nebraska, Indiana, and South Carolina would not adopt the standards. Turns out that home schooling advocates fear that Common Core will make home schooled children less competitive. The fiercest critic was the Home School Legal Defense Fund run by Michael Farris. Farris, a Baptist minister is very active in conservative Christian circles and, with some help from Jerry Falwell and Phyllis Schlafly, opposition to Common Core became a Christian issue which caused it to become a Republican issue. Standards are essential to success in any endeavor. Where does DeVos stand regarding Common Core? 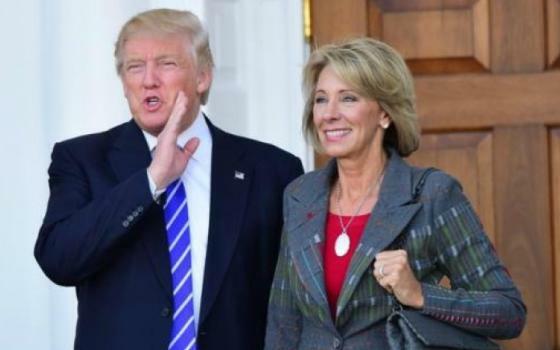 According to some of the reports I have read, DeVos was selected by Mike Pence. I am hoping that some Republican senators will be as concerned for education as they should be. DeVos does not deserve confirmation.